If you have got a better job opportunity but then there is long notice period at work which can be a big obstacle for you. In such a situation, writing a formal letter requesting early release from notice period can be of good help. Short notice resignation letters can surely turn the tables for you if written right. 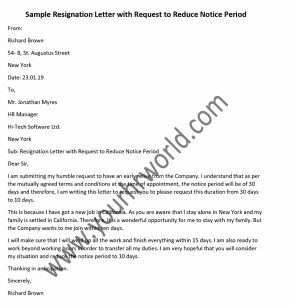 In this post, we have come up with small resignation letter sample along with various details that can help you with writing an impeccable sudden resignation letter. You can engage in having negotiations with your present employer to have an early relieve. Every company has different rules when an employee resigns and all of these policies are shared at the time of the appointment of the employee in the appointment letter. Buyout of Notice Period gives the employee a change to pay a certain amount to the company in order to buy an early relieve from the employer. So by giving this amount, the notice period can be bought. You can sit on the table to have negotiations with your present employer to earn an early relieve but the success would mostly depend upon your terms with the management of your company. You can have various discussions with your manager and also the HR department to submit your request for having an early relieving. I am submitting my humble request to have an early relive from the Company. I understand that as per the mutually agreed terms and conditions at the time of appointment, the notice period will be of 30 days and therefore, I am writing this letter to request you to please request this duration from 30 days to 10 days. This is because I have got a new job in California. As you are aware that I stay alone in New York and my family is settled in California. Therefore, it is a wonderful opportunity for me to stay with my family. But the Company wants to me join within ten days. I will make sure that I will wind up all the work and finish everything within 15 days. I am also ready to work beyond working hours in order to transfer all my duties. I am very hopeful that you will consider my situation and reduce the notice period to 10 days. I am writing this letter to submit my resignation and request an early relive from the Company. I am aware that the standard notice period for employees is of 30 days. I request you to please reduce the notice period of 30 days to two weeks as have got a new job in Chicago and the Company wants to me join within a span of two weeks. I have had a wonderful time working in this Company for five years. These five years have been full of new opportunities and progress for me. I strongly feel that this new opportunity will help me move ahead in my career and achieve my goals and I am positive that you will be supportive in this decision. I completely understand that the duration of 30 days notice period is for completing all the pending work and for transferring all my duties to the other employee. I promise to devote extra time to complete all my work and also pass on my duties within two weeks. I am hopeful that you will be kind enough to consider my request and approve it. Please accept this email as formal resignation letter as I am resigning from my position of Asst. Manager (Marketing) with New York Bank on January 23rd, 2019. I am aware that as per the Company’s policy, the standard notice period is two months. I would like to request the Management to consider my request for a shorter notice period because my personal circumstances require me to leave the job at the earliest. Therefore, I would be glad if you could consider my request and reduce the notice period to 15 days. I thank you for all the opportunities and guidance you have provided me in the span of last four years that have helped me grow. And it has been a wonderful experience working for such a reputed company. I will be happy to provide all possible assistance during this transition.